The Danielson Framework for Teaching is a research-based set of components of instruction. This white paper includes the findings of a research team made up of researchers from Illinois State University and the University of Illinois, Urbana-Champaign. The early learning examples in this document align to the 2013 Framework for Teaching and were developed through the shared efforts of early childhood teachers and coaches, school and district administrators, and early childhood policy and research groups to identify those aspects of teaching that are research-based and recommended practices for early childhood educators. Examples align to Danielson's 2013 Framework for Teaching domains/components and critical attributes in Preschool (3 & 4 year olds), and K-3 classrooms. 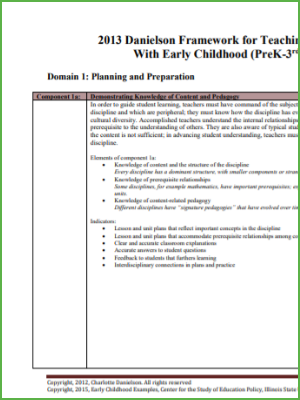 The 2013 rubric with early learning examples is available on for download below, or on the project website.